"NEIS - A giant digital database established by the government to gather the private information of students, parents, and teachers"
Fourteen civil society organizations and students groups established a coalition to struggle against NEIS and have carried out many activities to demand the abolishment of the NEIS, for examples, statement press release, online & offline demonstration and lawsuit to court and National Human Rights Commission. They have persisted that NEIS is illegal and unconstitutional, and actually ignores many international conventions such as the OECD Guidelines on Privacy, Universal declaration of Human rights and UN Guidelines on individual information. South Korean Government grants national ID number to all people, and collects finger prints from ten fingers, and have established a database system of the finger print. And the government integrated the national ID number database and finger print database. Furthermore, the government has tried to integrate this national ID number database and other databases of individual and private personal information, which is established by each department of the government. Many Korean people and civil society entities have criticized and condemned that this these database system infringed the basic human rights very severely, and requested that the government should try to investigate whether these kinds of system infringe the human rights before introducing them. But Korean government has been enforcing that kind of system including NEIS with few consideration of human rights. * The sentence means, "We oppose the NEIS under the name of Human Rights"
Korea Teachers and Educational Workers Union (KTU), which is progressive teachers group, strongly criticized that the system could release personal information while managing more than 200 pieces of personal information of 8 million students in an integrated way such as center-gathering database, and have demanded the government to stop the implementation of NEIS. May 12th, even the National Human Rights Commission (NHRC) announced that NEIS infringes basic human rights, and officially opposed the implementation of NEIS. 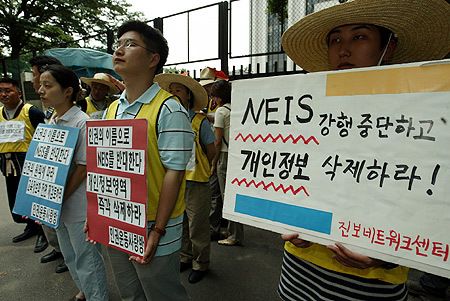 June 1, however, the Ministry of Education announced that they would enforce NEIS. This decision is to ignore the civil societies and KTU's requests. Finally, many human rights activists made a decision to start hunger strike struggle against NEIS in front of Myungdong Cathedral. And KTU announced that it would hold a national-wide massive strike with large demonstration on June 21st. 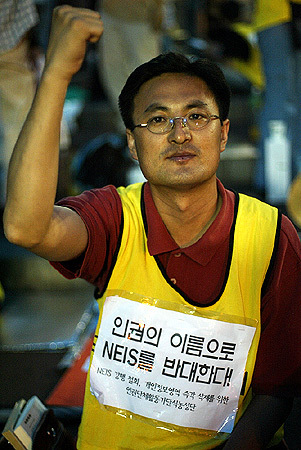 Oh Byung-il from Jinbonet, who is a member of the group of hunger strike struggle, said, "the core debate of NEIS is related to the human rights in information society, and we never allow the implementation of NEIS, and will continue this struggle until the government announces that they would halt the implementation of NEIS." ○ The department of education and human resources development of the Republic of Korea has been trying to implement the online information database system which is called the National Education Information System (NEIS) since March 1st, 2003. The NEIS is an online internet database system which has database servers installed in 16 local education departments of the municipal or provincial governments and connects all the primary and secondary schools and all the local district education offices using internet computer system and conducts 27 sections of educational administrative businesses which has been conducted in schools and local district education offices separately and respectively. The main sections are personnel management, budget, accounting, schools' administration, health, admission affairs, etc. Among them, the information of the three sections - schools' administration, health, admission affairs - is very personal, sensitive and private, and collected for counselling purpose only. Especially the section on health includes the students' medical history which should be kept secret. Though those kinds of information have been collected just in schools before the implementation of the NEIS, they are collected, managed and stored in the centralized database system under the NEIS. ○ National Human Rights Commission of the Republic of Korea advised the Department of Education and Human Resources Development May 12, 2003 1) to withdraw its implementation of the NEIS on three categories of student information including student transcripts and health records among 27 categories 2) to revise the concerned regulation on the personnel management of public officials to exclude the items in the attached list because of the possibility of their violating human rights. 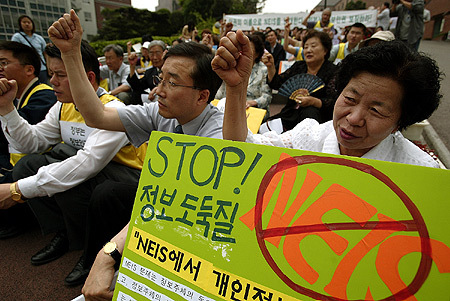 ○ The National Human Rights Commission came to the conclusion that the NEIS could infringe the basic human rights by citing Article 10 (the rights to persue happiness), Article 17(the rights to protect private life), Article 31, and Article 37 of the constitution of the Republic of Korea, Article 12 of the Universal Declaration on Human Rights, Article 17 of the International Covenant on Civil and Political Rights, Article 16 of the Convention of the Rights of the Child, OECD's Guidelines Governing the Protection of Privacy & Trans-border Flow of Personal Data, UN's Guidelines for the regulation of computerized personal data file, the Law on the Protection of Personal Information. - Three key parts of the NEIS-schools' administration, health and admission affairs, which contain students' personal records on their state of health, school work and grades, and school entrance and transfers - infringes on student's private affairs. ○ The KTU filed a complaint with the criminal court against the minister of education and human resources development, deputy minister of the ministry and the director in charge of the NEIS in the ministry for the crimes of misfeasance and illegal enforcement. 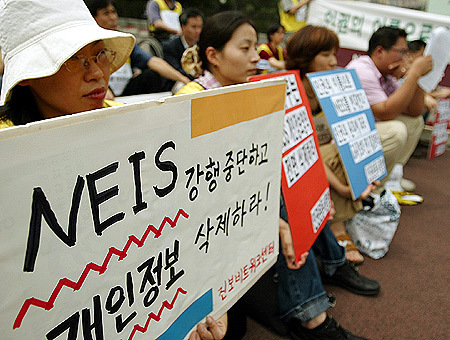 It is necessary that the ILO advise the Korean government that the government of the Republic of Korea, especially the Ministry of Education and Human Resources Development, withdraw the order that teachers of primary schools and secondary schools input the personal information of their students into the National Education Information System (NEIS).